Last Sunday I was at Roosevelt Island as I wanted to go to the Four Freedoms Park at sunset time. 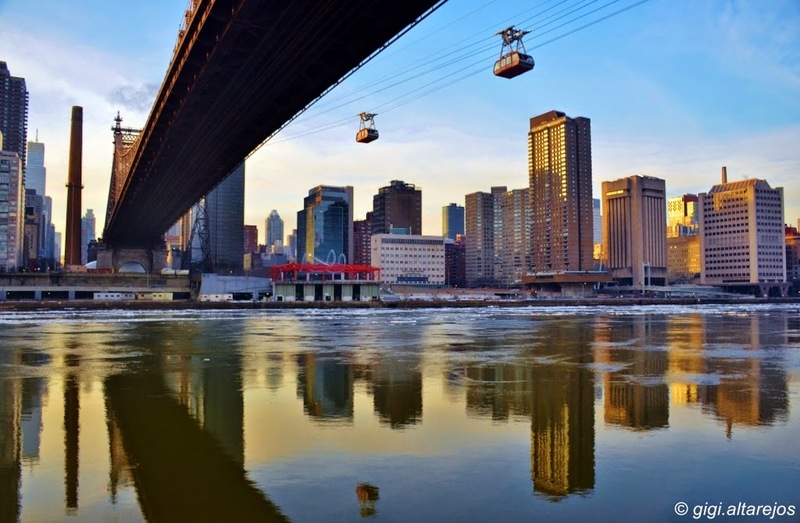 As I was walking towards the park, I realized that the East River was so calm, it perfectly reflected everything around it, even the Roosevelt Island tram high above. I arrived at the park at nearly closing time which was 30 minutes before the day's sunset. I didn't take a lot of photos in the park as most of its snowed-in area was cordoned off. This was sundown at the park, taken just before closing time. Sunset was beautifully reflected on the calm East River. As was twilight. It was so peaceful to see the fiery colors, it warmed that cold winter day. 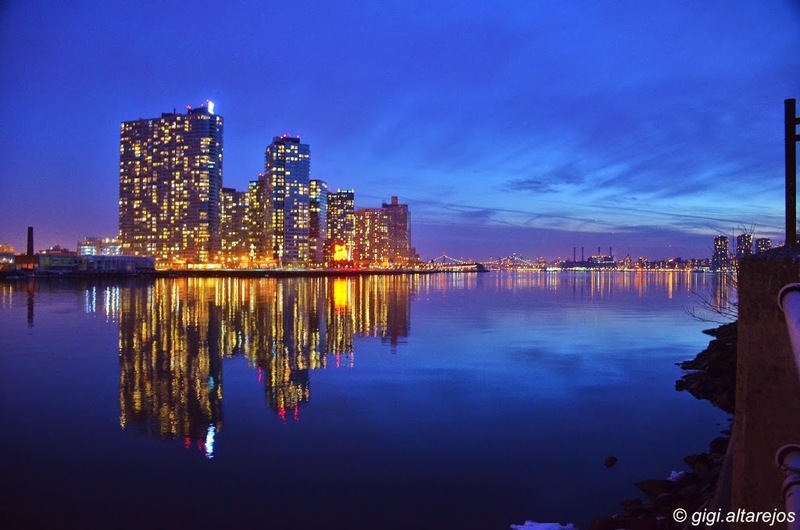 At blue hour, I was at the other side of the island facing Queens. Long Island City was shimmering across the East River. 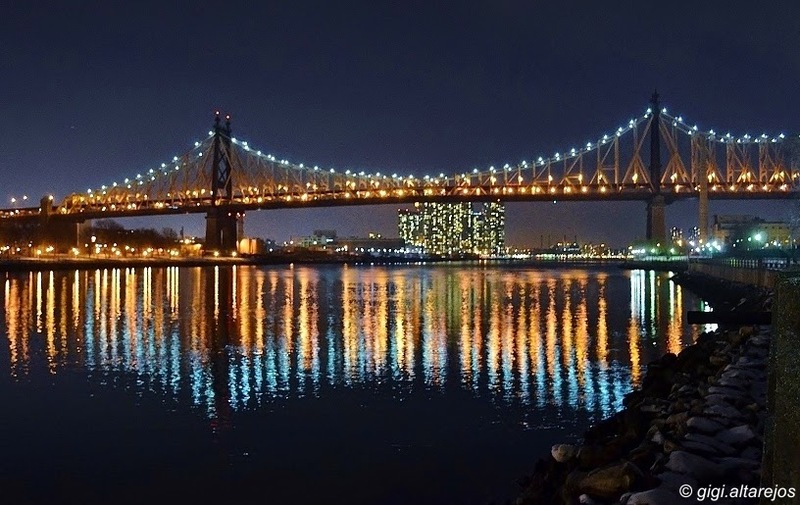 And the Ed Koch Queensboro Bridge was glittering like a jewel that night. Here's a couple of photos I stitched so you could have a panoramic view of midtown Manhattan reflected on the East River. But don't think all is calm, this has been a long winter, freezing parts of the Hudson and East Rivers. When you look at the picture, you can see the ice floes floating near the edge of the river. I haven't uploaded my photos on Flickr yet. I'll update this blog with the link to the rest of my photos once I upload them. So sorry to have been away for a couple of months. I've been going out and walking every weekend, I just didn't have the time to sit down and write a long blog. What I will do from now is post a few pictures of wherever I walked the past weekend, and when I get the chance, I'll write a longer blog with lots of pictures.